In any of these cases, or numerous others, has the unit inspector or operations team ever asked how these events impact integrity or the structural health of the asset? Thanks to a new software tool in Sensor Networks’ webPIMS™ data management, trending, and analysis software called, “Time-Gated Corrosion Measurement”, it has never been easier to quantify corrosion rates over a specific time period. 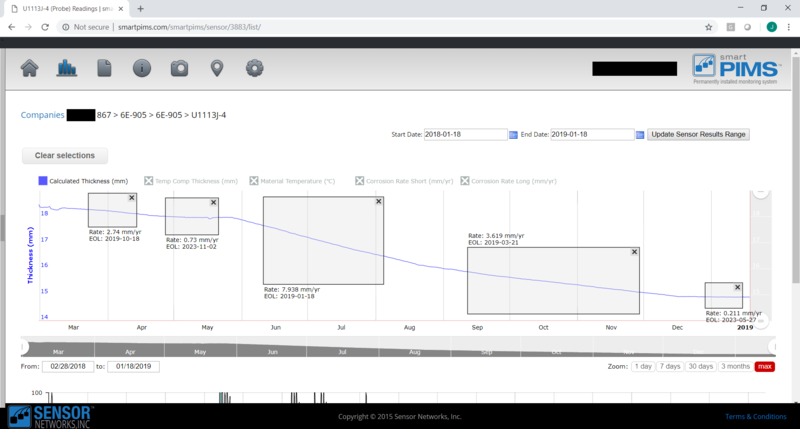 Simply click and drag over the desired timeframe to see the corrosion rate and End-of-Life (EOL) estimation. Overlay and compare corrosion-rate data with operational data to better understand what happens during specific events or upsets in your facility. “Time-Gated Corrosion Measurement” can help improve operational efficiency and help operations, inspection, and corrosion teams be more proactive and understand the effects of events BEFORE they happen a second time. Know your unit inside and out with webPIMS’ new “Time-Gated Corrosion Measurement”. webPIMS™ cloud-based, back-end corrosion/erosion data management software allows users to quickly and easily analyze, set alarms for, trend, map, export and report metal-loss data and rates. Request a demo below to learn more about webPIMS™ and what it can do for your trending analysis and archiving workflow.